Is yours til you no longer stay.” I can’t imagine America functioning like that- we all book our rooms months in advance and plan out every single detail all the time-that’s how our system works. I have thoroughly enjoyed the low key pace and non obligatory day-to-day around here. So nice! Some places will take same day reservations -if they have a phone you can call and check. However-its kind of nicer to see what you ae getting roped into. 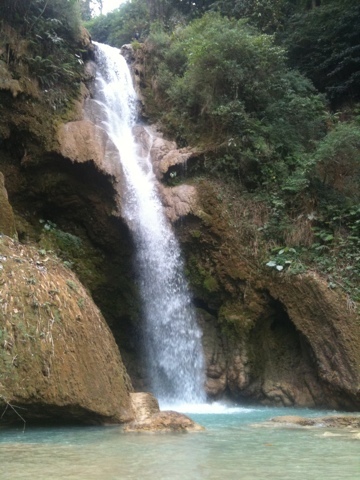 I’ve spent the last few days frolicking in this epic faerie mermaid waterfall here in Luang Prabang -so worth it!! Super refreshing and so beautiful!! It’s about an hour from town and through the most amazing farm lands mountains and fields. The goods here are all unique and hand crafted-they definitely have their own Laos flavor including lots of huge silver chest pieces and headpieces from the hilltribes. 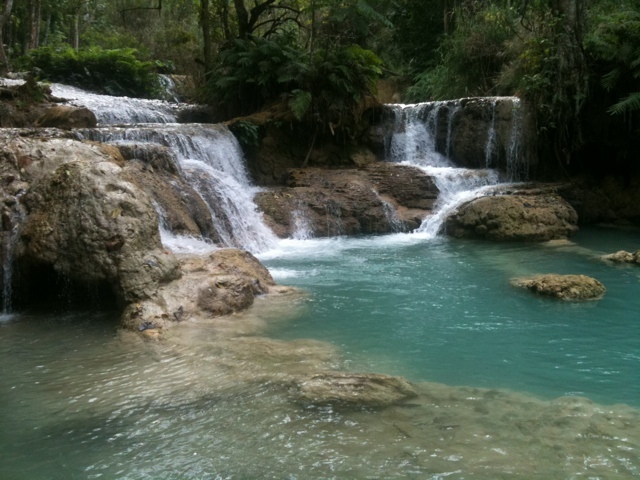 Right now I’m staying in this big old Laos house run by two Laos families. The floors are a single layer of wood and the roof is thatched bamboo. I really enjoy thinking about all the families that have occupied this space over time. Laos culture is very communal, usually 10-15 people to a place and they share everything- all meals are communal water is communal- everything. They are a very sharing people. Okay tonight I take a night bus to Vientiene-the capitol of Laos.